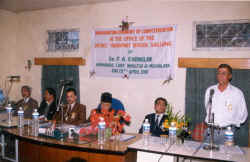 The District Transport Office, Shillong of the Government of Meghalaya has gone online with the inauguration of the computerisation of this office by the Hon?ble Chief Minister of Meghalaya, Dr. F. A. Khonglam on the 15th April 2002 by accepting the fee for new vehicle registration and then printing a new Registration Certificate. The National Informatics Centre, Meghalaya State Unit and the Transport Informatics Group, N.I.C. Headquarter have jointly computerized the office. In the process the District Transport Office, Shillong has also become the first District Transport Office, not only in Meghalaya, but also in North East India, to have online computerization. Meanwhile, the Meghalaya Transport Department has also undertaken to computerise other D.T.O. offices in the State. The computerisation of DTO offices in Meghalaya will not only help improve the services being rendered to the members of the public, but also serve as a safeguard against those who seek to bypass the law. This in turn would improve revenue collection, bring about better office management and help plug whatever loopholes, which may be there. With E-governance gaining in importance, the increased use of computers in government offices also seek to de-mystify work in such establishments and also bring about transparency, help the members of the public gain more access to relevant information, speed up delivery of services and expedite redress of public grievances.